I fully intended to post something else tonight, but I’m in pain and thought this would be a perfect time to share a pin that came through a chronic illness board that I follow. I don’t like to talk about my pain, because it never fully goes away. Seldom is it below a 6 on a 1-10 scale, which is hard for most to comprehend, and a lot of people don’t believe that it’s real, even doctors. A coping mechanism that a lot of chronic pain sufferers develop is to blow off the question of “how are you?” We often say “the usual”, “it’s all good”, or just totally evade answering. Most of the time people don’t know how to handle a true answer and often it makes them uncomfortable. 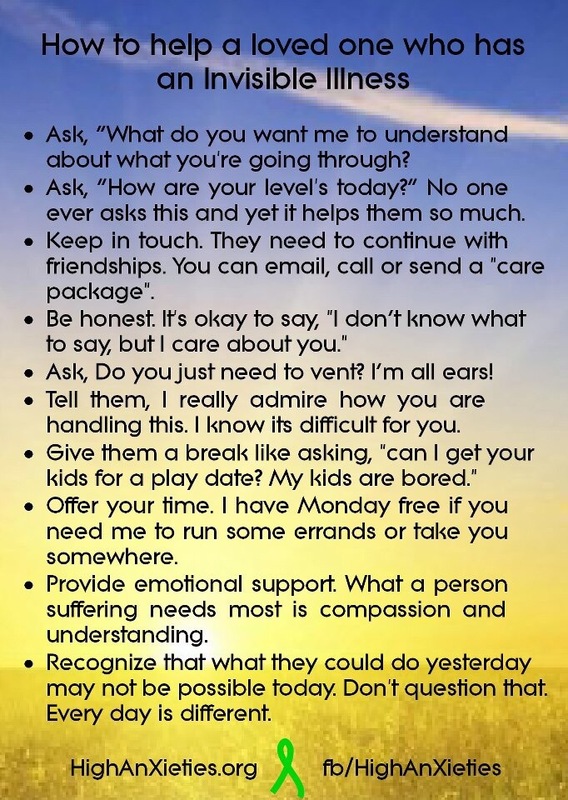 If you are sincere in wanting to reach out to someone in your life that suffers, then try even one thing from this list. The fourth one is a great one. If you do most anything from this list you will be a shining star in an otherwise nonstop darkness, so to speak. Just believe in them and be there. We usually don’t think you’d actually want to be there, or that we must be so boring to hang out with, so we pull back. Someone reaching out, even just in a text to say “I’m thinking of you” or “I just want you to know that I’m here for you if you need something” can sometimes truly be the difference between life and death for them. It’s hard to see the life all around beyond the constant struggle to make it through each day. Bless the person who originally posted this and you for reading, and especially if you ever try one. Posted in Uncategorized and tagged CFS, Fibromyalgia, help, Invisible Diseases. Bookmark the permalink.